Make Me an Offer 3X Discounts! Snag an awesome bundle, custom made for you! For a limited time, receive 3X the usual discount! 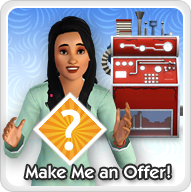 Make Me an Offer’s triple discount weekend ends Thursday, 6/5 at 10 AM, PST! THIS OFFER IS BEING ISSUED TO YOU FOR PROMOTIONAL PURPOSES ONLY AND DOES NOT CONSTITUTE A CREDIT, CHARGE, DEBIT OR GIFT CARD. OFFER EXPIRES June 5, 2014 AT 10:00 AM PST. VALID FOR NEW PURCHASES OF THE SIMS 3 CONTENT (“CONTENT”) THROUGH MAKE ME AN OFFER FEATURE ON THE SIMS 3 STORE (store.thesims3.com/) ONLY. VALUE OF DISCOUNT WILL BE DEDUCTED FROM CONTENT BUNDLE PRICE AT TIME OF PURCHASE. REQUIRES ORIGIN ACCOUNT (OR THE SIMS 3 ACCOUNT). MUST BE 13+ TO REGISTER FOR AN ORIGIN ACCOUNT. USE OF CONTENT REQUIRES THE SIMS 3 (“PRODUCT”). OFFER MAY NOT BE SUBSTITUTED, EXCHANGED, SOLD OR REDEEMED FOR CASH OR OTHER GOODS OR SERVICES. MAY NOT BE COMBINED WITH ANY OTHER OFFER, GIFT CARD, REBATE OR OTHER DISCOUNT COUPONS. CUSTOMERS ARE RESPONSIBLE FOR SHIPPING, HANDLING AND APPLICABLE SALES TAX. VOID WHERE PROHIBITED, TAXED OR RESTRICTED BY LAW. SEE END USER LICENSE AGREEMENT AND DISCLOSURES ON WWW.EA.COM/1/PRODUCT-EULAS.